What is the purpose of the new exit portals? 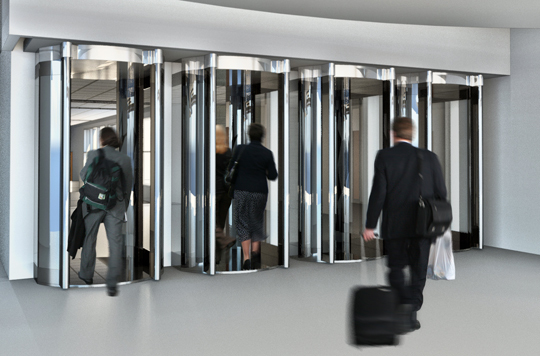 The exit portals allow passengers to exit the airport concourse safely and expeditiously, while preventing unauthorized individuals from entering the secure area of the airport. They also eliminate the need for law enforcement or other security personnel to monitor the exit lanes. Do the exit portals screen exiting passengers? The exit portals do not contain any screening equipment. Passenger screening is only conducted by TSA personnel at the security checkpoint, and only for departing passengers. Are photographs being taken of exiting passengers inside the exit portals? No photographs are taken of passengers as they filter through the exit portals. What happens if there is a fire and people cannot exit the terminal through the portals? Emergency/fire doors are located adjacent to the exit portals. Can I become “trapped” inside one of the exit portals? No. If, for some reason, the automatic door in the exit portal door doesn’t open, an alarm will alert our security office nearby in the terminal who will be able to remotely open the door within seconds.